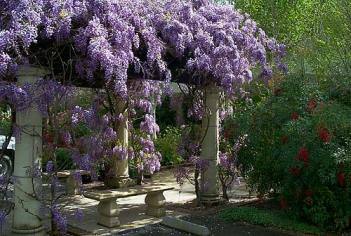 It's�a sentimental Victorian plant that is perfect for shading pergolas, arbors and�porches. Once established, it grows like a weed, up to 10' per summer. It takes work to keep it under control. Robins love to nest in their tangles: I have a pair of�robins nesting in mine right now, so I cannot trim it until the babies leave the nest. Like many exotic, introduced plants, it can be very invasive and aggressive: eliminating wild stands of wisteria is a tough job. I grow sweet-smelling�Autumn Clematis up my Wisteria vines, so the vine�serves double duty. Autumn Clematis is another one of those strong vines that grow like crazy,�with amazing September perfume. Gorgeous! What do you think of Amethyst Falls? I was thinking of that for training up my deck. Did the robins return this year? "The record for the fastest growth of an individual goes to a tropical species of bamboo that reportedly reaches 100 feet (30 m) in three months. [Note: This is an unsubstantiated report. It might be only 50 feet (15 m) in three months.] Growth increments of three feet (0.9 m) a day have been recorded--an astonishing 0.0002 miles per hour. Clematis. The upper-class version of Kudzo. I planted some to fill cover one side of my trellis - the other side is a climbing rose, and I cuss it. Plants are sensitive and I talk nicely to my indoor plants except for the weeping figs because if you use the wrong tone with them, they dump their leaves. I hum hymns when I water them. Low and sweet Gospel hymns. But the clematis just grow in my face no matter how I swear at them. I say 'them' because they sneak around underground and make babies that come up across the paved driveway. They even like Weed-B-Gone-U-Sunbitch. Never plant bamboo. It travels as well, and pretty soon you will start wearing a loin cloth and using a blow-dart gun on your squirrels. Ahh--thank you. I thought that Clematis looked familiar! Took 4 years to get flowers on my peony. I have just ignored it for the last 2--no fertilizer, no bug spray, no nice words--just stubbornly refused to acknowledge its existence. As I write this there are 12 buds, six will be gorgeous (I think). WIth regard to wisteria. We have a white one. It is about 5 years old and this year the leaves are very sparse and have a yellow tinge, not many flowers--any ideas? pH levels? They're oft overlooked. PH level is why one limes the yard, right? It works better than fertilizer on my grass. The wisteria might have mites. I have a row of Lygustrum and two bushes turned puny and the leaves yellowed. I used that pesticide that you hook to your hose and that fixed it. Then I used Miracle-Gro and all is well. I used a ton of Miracle-Gro on a zinnia patch just to see what it would do. I had zinnias taller than me. I had a zinnia nightmare one night and now I follow the directions on the box. Thanks folks. I will try both the pesticide, and checking the PH.